The land encompassing present day May-Lan Tree Plantation came about after the marriage of Calvin Lancaster to Sally Clark in 1924.They purchased nearly forty-five acres in the early 1930’s. Ms. Sally worked in the sewing room of Riegel Textile Mill in Ware Shoals. Mr. Calvin worked as an electrician at the Kendall plant in Pelzer. He was well-known for his machine skills, especially his hand-made knives. The land was mainly row cropped at that time, with Mr. Calvin taking the time to raise quail and work (as instructed by Ms. Sally) in the yard. The land was inherited by their son, Charles, in 1972. He had married Bobbie Black in 1952 and lived just across the road. Mr. Charlie and Ms. Bobbie had enough farming growing up, so they accepted jobs that took them away form the land. Mr. Charlie started B&L Industrial Supply, which he operated until 1992. He then went to work for Harold’s Sales, selling fire trucks and fire fighting equipment. 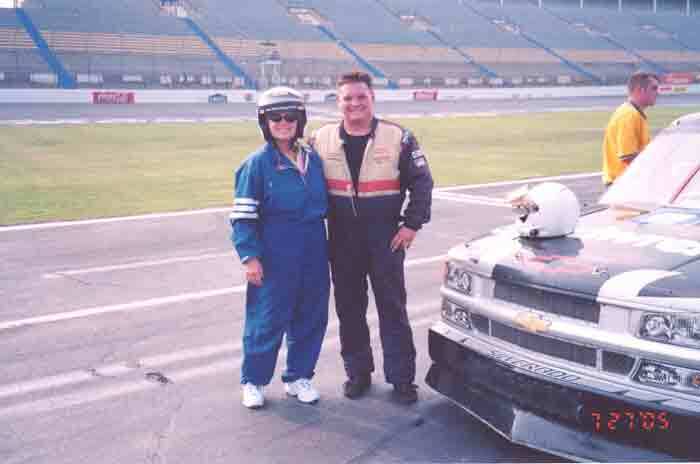 After working at Carolina Blouse, Ms. Bobbie worked as a bookkeeper for a couple of well-known sporting goods stores, before going to work at Hejez Country Club. She retired from there in 2000. She then could be found working in her roses or helping out the farm by operating the cash register, checking in groups for their visits, or making her tasty candy sold at the farm store. Part of the land was leased for row crops, while the rest was used for horse pasture. In 1976, their daughter, Sandy, graduated from Winthrop College and accepted a job teaching at Belton Middle School. It was there she met David Mayberry. After some serious chasing, we won’t say by whom, they were married in June, 1978. 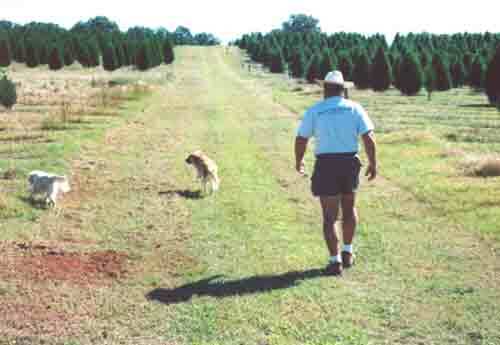 During the chase period, David had discussed with Mr. Charlie how he had worked in Christmas trees while attending Appalachian State University. Mr. Charlie got it in his head that this would be as easy way to make money (ha, ha), so together they decided to start a harvest your own tree farm. Problem was, neither knew anything about how to grow a Christmas tree. Fortunately, before planting anything, they joined the S.C. Christmas Tree Association and, shortly after, the National Christmas Tree Association. This helped make a somewhat more informed start. So, in the spring of 1978, the first trees were planted and May-Lan Tree Plantation was born (May from Mayberry and Lan from Lancaster). Those first trees were Virginia pine, white pine, and Eastern red cedar. Since then it has been an unending learning process. There was no idea as to the tremendous amount of physical labor involved in getting a tree ready to market. There are constant demands to address problems presented by insects and disease. It is an unending battle with competitive vegetation. And –oh yes, let us not forget that one uncontrollable factor- the weather. Much time and money have been spent on all of these. The first trees were sold in 1984. EVERYTHING was done by hand. We helped bring the trees from the field, shook them, and they all were pulled through the same size baler-regardless of size. We have a tractor drawn wagon bring the trees from the field now. More equipment is available to prepare the tree for its trip home. A much more efficient method is now used to price and pay for trees makes things easier and more fun for everyone. Our little ‘general store” is now heated and smells of tasty treats. We now specialize in carrying quality South Carolina created products. Visitors look forward to our hot cinnamon and wrecking any chance of a diet with the special way we prepare a caramel apple. The store is always changing and we hope to greatly expand it in the future. One of the fun parts of a visit to our farm is its people. We have been lucky to have hard working employees who enjoy interacting with our visitors. We look at it as a challenge to make someone smile. We lost our chief smile maker in March of 2000. 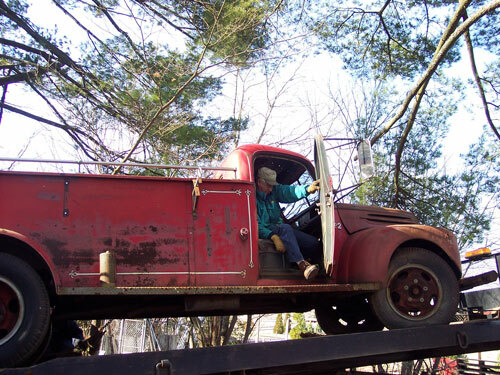 As our tractor driver, Mr. Charlie gave visitors a ride on the tree wagon they will not forget. He never met a stranger and could spout off one liner that had you on the ground. Though feeling the effects of cancer treatment, he did not miss a single trip around the field that last December-nor the chance to zing someone with some of his down-home humor. He is missed. Ms. Bobbie heard from one of her many sources that seem to know everything- as there seems to one or two of these in every community –that Mr. Charlie was having just too much fun where he had gone, so in April of 2007 she surprised him with a visit. Their battles of humor and wit will be the subject of discussions for some time to come. The pumpkin patch and hayride visits were added in 1998. It has been a big hit, offering a wide range of activities for younger children. 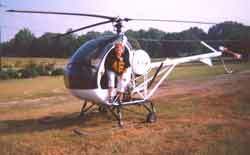 It is an adventure that is constantly changing in order to keep it both fun and educational. You can learn much more about this part of our farm by clicking on Fall Activities. For us personally, a big part of our enjoyment of our farm is our animals. They all play a special part in our lives, especially our dogs. Ted was the first and best known, of our “tree dogs”. There are countless stories told by visitors, staff, and family of his antics, strength, gentleness, and courage. He was a fixture, seeing everything, missing nothing, always ready for a candy cane and a hug. Many children looked for Ted as soon as they arrived; wanting to pet the gentle giant they had met the year before. He watched them grow up. Ted now rests under the oak at the end of the parking lot. He watched “his humans” as they worked in the field on many a steamy summer day. Today he still faces his beloved trees. 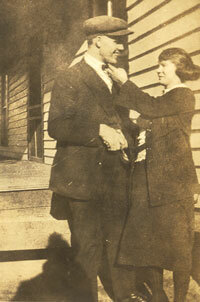 By his side, is Lucy, who adored him and followed his every step. With them is Max, the Dalmatian, who went with Mr. Charlie on EVERY trip around the field. My, we have been blessed. We think Annie is our next tree dog. Time will tell. The farm is changing its look. We have reduced the number of trees used for Christmas so they can be better managed and we can improve quality. We have added a flag area to show how we feel. We are trying to get more involved with causes we feel most strongly toward. We hope to add education programs and displays to aid the public in realizing how important the forest is to the survival of our planet. As with all things in nature, May-Lan Tree Plantation is in a constant state of change. We look forward to the fun and challenges that lie ahead. 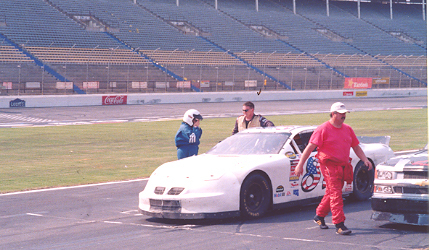 600 hp (horse power) NASCAR race car. 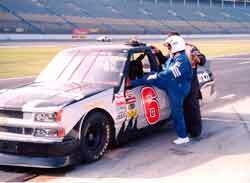 The following Fall she drove Darlington Speedway as well. 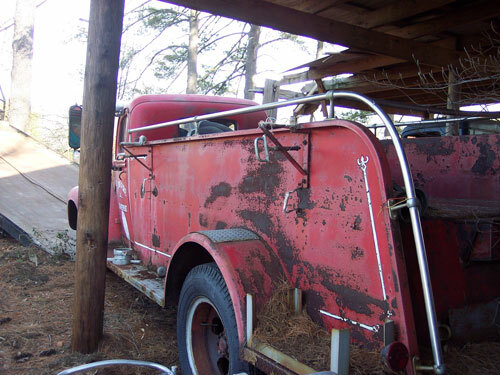 My late father-in-law, Charles A. Lancaster, had a thing for firefighting stuff. So much that before his passing in 2001, he had gone to work for Harold’s Sales- out of South Boston, Virginia -and sold fire departments all over South Carolina anything they could use to defeat a fire and save a life. He did love and respect those he served and worked hard to help them get whatever they needed. One of the more fun things he did was when HE got to demonstrate equipment—which included trucks! It was not the least bit unusual to pass his home and there would be parked a huge, shiny red fire truck of some type; a brush buggy, pumper, ladder- whatever. And if he got home late you could expect lights and siren! 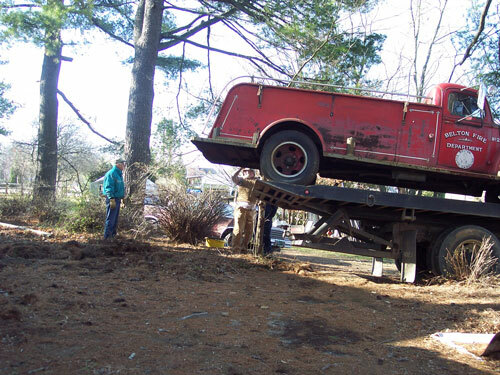 I guess he got tired of driving someone else’s truck because one day there appeared in the yard a 1949 Ford pumper. 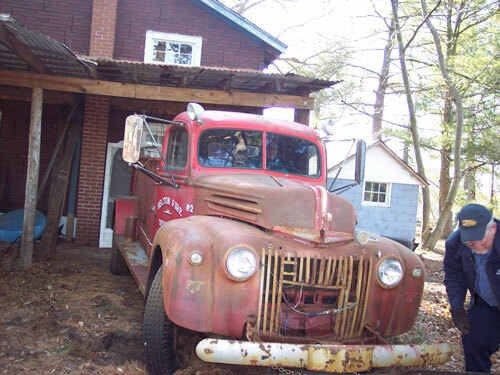 It seems the town of Belton needed to get rid of this truck and he thought it would be a great addition to the farm, thus the start of May-Lan Fire Department. I could see this could be fun for us and the kids visiting our farm especially after he said he was going to restore it to its original grandeur. The restoration consisted of a new battery. Afterwards came numerous other projects and distractions until it went under the barn for storage. There it stayed until winter of 2008. My wife then agreed to sell the truck if we could find it a good home. 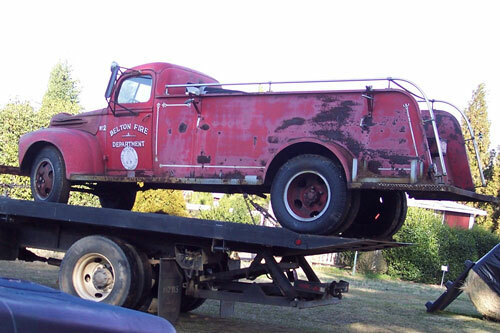 While trying to learn some history of this truck, I learned that the Captain of Belton’s Fire Department was VERY interested in obtaining and restoring this truck to be used for educational and publicity purposes. It was this thing of paying for it that had him puzzled. 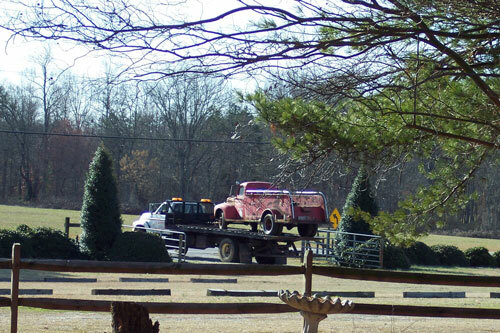 Following are pictures of the truck and its move back Home. 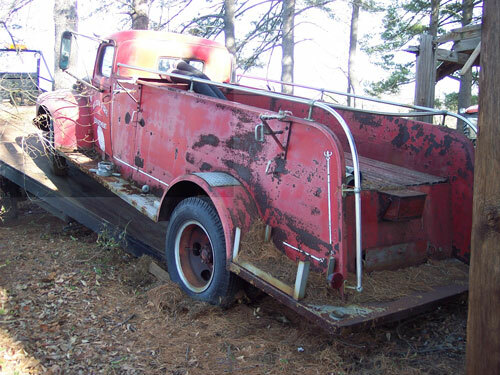 We ask you to help by donating cash, time, or parts and thus save a piece of Belton history. "Come on..get up. It won't be that hard to load" "Wonder if they would miss this pole?" "Missed the pole... Now onto the carrier" "You mean to say I slept in this thing HOW LONG?" "Maybe with a running start I can get it the rest of the way?" "OK., we are FINALLY ready to travel!!!!"